I think we can safely say goodbye to the polar vortex now. Happy springtime to all of you! A lot of the ice has melted. The nearby creek is robustly flowing. Ollie dog and I went for a two hour ramble the other day and he got properly happy and muddy. Some of the trees were showing off tiny yellow-green buds and it was wonderful to see bright green moss growing on rocks. Soon the rhubarb will be popping-up its brainy heads in the garden and foragers will be delighted to have morels, wild leeks, fiddlehead ferns, and watercress to pick. Today, my favorite maple farmer, Dave Cook, said that the sap is finally flowing in time for sugaring season. What are you excited about? Come along with me to the beautiful city of Lyon to whet your appetite for the upcoming bountiful season. 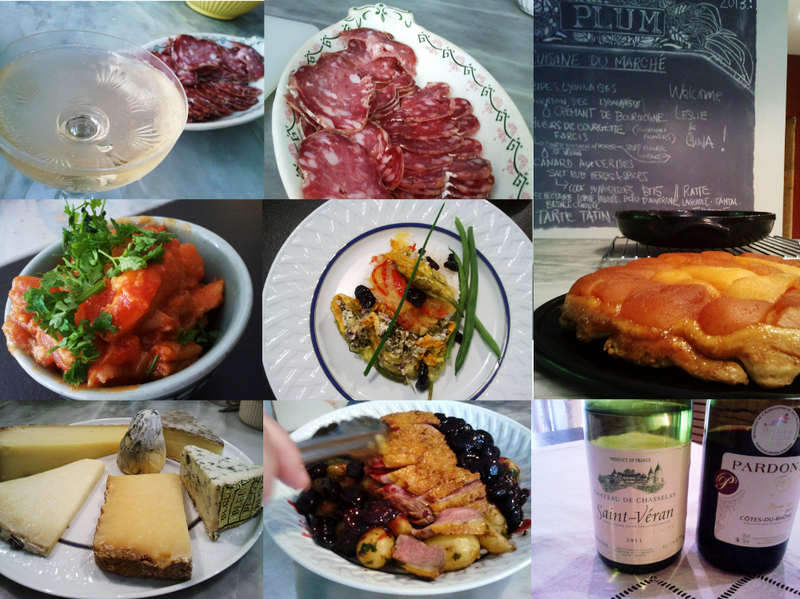 If you have not been following the blog, check out the first part of my cooking adventure at the Croix-Rousse Market. 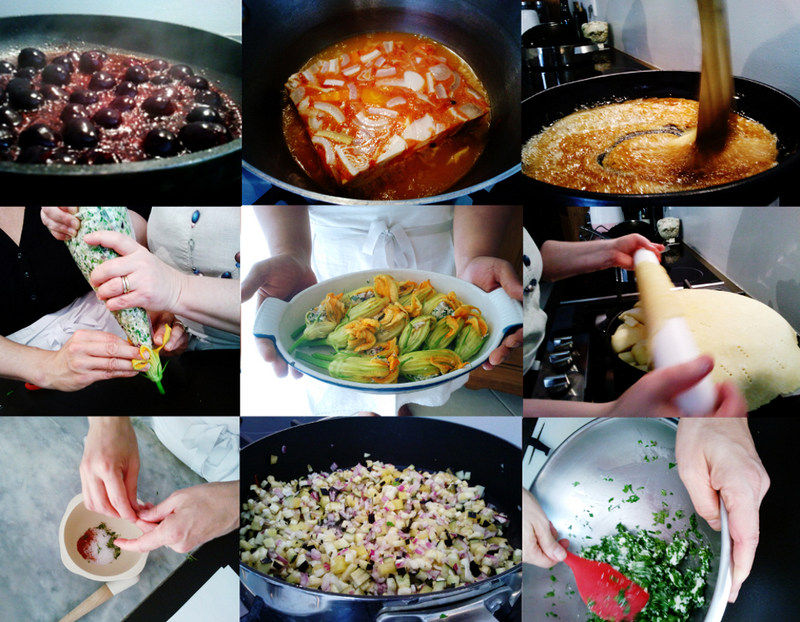 We spent a day shopping at the market and cooking up a multi-course meal at Lucy Vanel’s teaching kitchen, Plum Lyon. Heaven. After the market, Gina and I helped Lucy unload her seemingly bottomless market bag on wheels. I carefully took the cheeses out and couldn’t help but give the baguettes a little squeeze to feel that mouth watering crunch. I remember the intense scent of the huge bouquet of herbs when Gina shook and washed it. We peeled some apples and pears for the tarte tatin. Lucy served a plate of the saucisson sec and poured Cremant de Bourgogne for our apéritif. She then simmered the jellied tripe with tomato on the stove then scooped some up into little plates and sprinkled it with parsley. Delicious! Some onions and red peppers went into a pan for the confit and rice went into a pot. Lucy showed us how to properly make pâte brisée. It has to be done quick and with minimal handling. I learned the term, fraiser, which means to knead the dough with the heel of your hand. Lucy advised us to use the technique just once when making a tart dough. After resting and cooling the dough, we made the caramel and arranged the apples and pears on top of it. A little more sprinkling of sugar and dots of butter then it was ready to be covered with the pastry and baked until brown and bubbly. After that, we chopped up some zucchini, eggplant, red onions, bell pepper, and black olives to be sautéed in a pan. We then incorporated it with some goat’s cheese and fresh herbs. Even better, the mixture was piped into delicate squash blossoms, drizzled with olive oil, then baked. For our main course, we prepared a duck breast by scoring the skin to allow the fat to flow better and ensure a crisp texture. The fat was saved from the pan for the potatoes. For the sauce, we pitted cherries and simmered it with quince jelly, orange juice, white wine, and butter (as desired, Lucy said). Can you just imagine the smells? We sliced the baguette, poured the wine, then had our meal at Lucy’s elegant dining table. It was covered with a crisp, white cloth and we ate from Limoges porcelain. 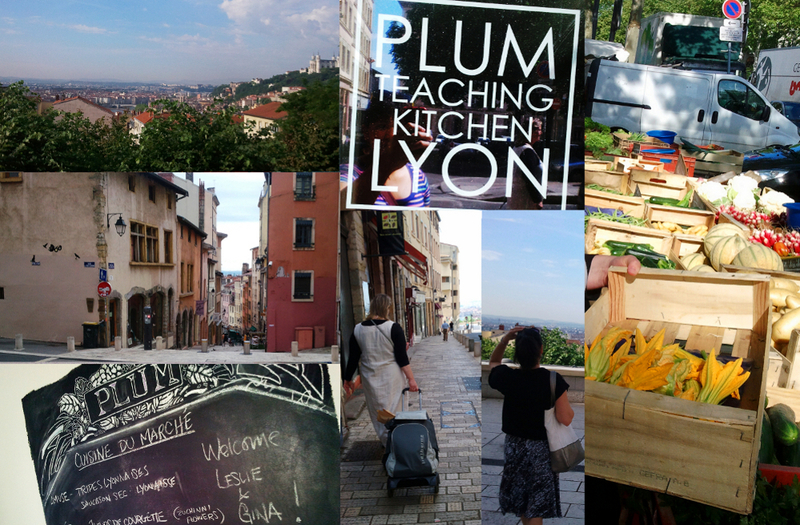 If you ever make it out to Lyon, I highly recommend taking a class at Plum Lyon. Lucy is so sweet and knowledgeable about French cooking. It was like visiting a friend. Before Gina and I left, Lucy printed us a list of some places we must check out including restaurants, kitchen supply stores and her favorite chocolate shops. I credit Lucy and David Lebovitz for leading me to my favorite chocolate ever, Bernachon’s Kalouga bar. If you can’t get enough Lyonnaise food, check out our dinner at Paul Bocuse’s L’Auberge. Bon printemps!